PowerShell is clearly the way forward at Microsoft, particularly as more workloads are moved to the Azure cloud. Learning the language of POSH, as it's colloquially become known, is definitely one of the best investments in time an administrator can make. It always amazes me how powerful and consistent this language is compared to the multitude of obscure and non-standard tools of the past. A great example is replacements for our old friends ping, tracert, ipconfig and the like. There's a great article on Technet that describes some of the more useful and common ones. Go forth and Get-NetIPConfiguration today! Windows 8.x features a very useful right-click context menu that offers quick access to many common administrative tasks. While this was initially a concession Microsoft made for the ridiculous misguided removal of the Start Menu, after using this for a short period of time it quickly becomes obvious how much better this is than the random collection of places these shortcuts existed in the past UIs. Periodically, however, Windows will lose track of these shortcuts and right clicking the Start Button will result in...nothing. Most often this issue presents itself due to an apparent bug in Sysprep, or with Roaming Profiles between different versions of Windows. What few people know is that this menu (known internally as "Win+X") is actually created on the fly from a list of shortcuts stored in the file system. Not only can this menu therefore be customized by modifying shortcuts in these folders, but it also leads to our solution to fix the mysteriously non-working menu. After a long 55 days Microsoft has finally released a major update to the Technical Preview of Windows 10. In typical fashion they rambled on about how they're changing their build process, and going to release the product this summer, and how wonderful everything was going to be now as we users would be getting builds fast and furiously. @nckatnt @Macca_Chief We're getting a bunch of reports on this. Working on it. More info as soon as I have it. Make sure you are using drivers from your system vendor. The most troublesome items seem to be Intel HD Graphics and Networking. If you're using Microsoft's or Intel's published non-hardware-specific drivers, often this is causing systems to get locked in a Windows Update loop trying to download and install bad drivers over and over. This blocks the next build from coming down, as it appears to want a pristine Windows Update status before starting. So, go uninstall any drivers and re-install the versions from your hardware maker's site. I'm looking at you Lenovo and HP owners. Download this hotfix from the Microsoft Update Catalog. Make sure you put on your rose colored glasses and go back to 1998 first though. You need to do this from Internet Explorer and install an Active-X Control. Then add the 32 or 64 bit hotfix to your "basket". Then download the basket. Then right click on the downloaded file and Run As Administrator. You know, because they couldn't just publish a link to this. Good luck and happy testing! A semi-common error seen on various Windows 8.1 and 2012/R2 systems is the following during the start of system backups that use VSS (i.e. most backups). This often causes the backup process to hang for a long period of time, or fail. Much digging through forums has found what appears to be the cause. During backup a VSS process running under NETWORK_SERVICE account calls cryptcatsvc!CSystemWriter::AddLegacyDriverFiles(), which enumerates all the drivers records in Service Control Manager database and tries opening each one of them. , The function fails on MSLLDP record with "Access Denied" error. Turned out it fails because MSLLDP driver's security permissions do not allow NETWORK_SERVICE to access the driver record. What causes this to have incorrect permissions in the first place is unclear, but a fairly simple fix exists. We've tested this on several systems without issue, but your mileage may vary. If so, the problem is resolved, and there's no reboot required. The next backup should complete successfully. A common scenario that bites many a company that extensively uses Windows imaging for deployments, is that Offline Files completely melts down after a newly imaged system is setup. Windows could not start the Offline Files service. Error 3: The system cannot find the path specified. The best resolution is to make sure the reference system (where you took the image from) always has Offline Files disabled before the image is taken, in addition to Sysprep being run. Reboot the computer, and the Offline Files database will be reset and recreated. Offline Files should start normally, and things like Folder Redirection and the like will follow. Offline Files, Folder Redirection and DFS are some of the most complex to configure Microsoft technologies with an enormous amount of gotchas and hotfixes. It's one of our most frequently requested support items from customers. We've developed a great deal of expertise and best practices around these and will be posting an article soon detailing our findings. In the meantime, why not contact us to help today! As part of the complete re-architecture of the Remote Desktop Services Roles in Windows Server 2012, Microsoft moved the cheese in a serious way. While there is much that is great about the new design, and we applaud their decision to more holistically approach all of the disparate remote connectivity and VDI options provided by the OS, the UI is an incomplete, slow and confusing mess. One of the biggest problems was that they severely hampered the built-in Administrative RDP connections that have existed since Windows 2003, and got rid of all of the old TS/RDP Management Tools. Even more painfully, they turfed everyone's old friend RDP Session Shadowing. Thankfully this has made a return in Windows Server 2012 R2, but the management and UI haven't improved much. As a result of all of this, it became difficult to do the simplest of tasks. One of the most common that many admins used the Remote Desktop Services Manager utility for was connecting to another session, or ending a hung or disconnected session. Alas, no RDS Manager for you dear 2012 User. Too simple! What to do? Task Manager. Seriously. While this functionality has existed for quite some time, it is (by my quick survey of admins) unknown and rarely used. It is, however, surprisingly functional. 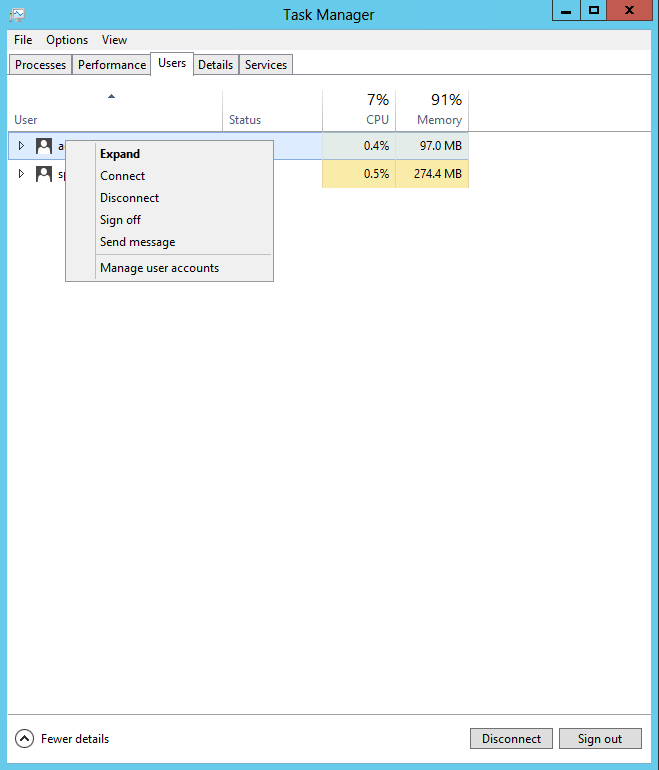 Simply bring up Task Manager, click More Details to switch to the "Actually Useful" mode, and then click the Users Tab. All current sessions will be displayed, along with a list of their processes. Right click on any session to connect to or end the session.